"Feature neutrality" is an issue that has received much attention among linguists. For example, consider the sentence, "I have never, and will never, put my name on this document." Here, the verb 'put' acts simultaneously as a past participle (as in "have never put") and a base form (as in "will never put"), and is therefore said to be neutral between the two forms. Similar examples have been found for many languages. The accepted wisdom is that neutrality is possible only for morphosyntactic features such as verb form, gender, number, declension class-not at the level of gross syntactic category, where the semantic differences are more significant. In other words, it has been claimed that "category neutrality," where a word or phrase is used simultaneously with more than one syntactic category, does not exist. (A famous example is the glaring ungrammaticality of this sentence, in which "can" is used simultaneously as a main verb and auxiliary verb: "I can tuna and get a new job.") 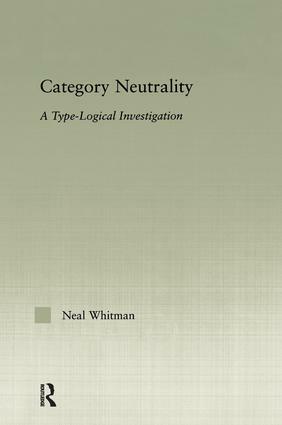 In this book, however, Neal Whitman shows that category neutrality does exist in English. This not only challenges the current thinking, but also raises foundational questions about the nature of ambiguity.